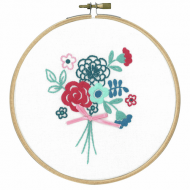 Embroidery kits with printed fabric and threads for all skill levels. 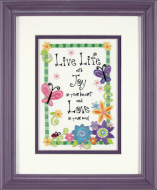 Please allow 2 weeks for delivery as we keep only a selection of designs in stock in the shop. 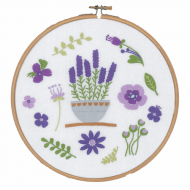 You choose the colours and stitches to use on your design to make it uniquely your own. It's like colouring with thread! Approximate finished size: 5 x 7inches (12 x 17cm). Kit contains thread assortment, printed white cotton 'Cottage Cloth' fabric, needle, and instructions. 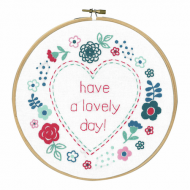 Kit includes: thread, printed fabric, needle and instructions. Pillow finishing materials are not included. Finished size: 12 x 9in (30.5 x 22.9cm). 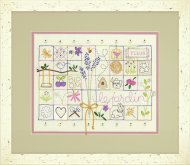 A variety of crewel embroidery stitches and dimensional add-ons make Le Jardin fun to stitch. Kit includes: pre-sorted thread, printed ivory fabric, ribbon, plastic pearls, buttons, needle, easy instructions. Finished size: 14in x 11in, 35 x 28cm. Design to be embroidered onto ecru linen using Anchor stranded cotton. Skill level 1. Approximate finished size: 20 x 15cm. Design to be embroidered onto white linen using Anchor stranded cotton. Skill level 1. Approximate finished size: 20 x 15cm.